1. Ideal location in CANNAREGIO, REAL HISTORICAL CENTER of Venice, just 30 meters from the house of the painter Tintoretto in Campo dei Mori, 10 minutes by walk to Rialto Bridge and 15 to Sa Mark square. 2. JUST RENOVATED. So absolutely clean, hygenic and confortable. 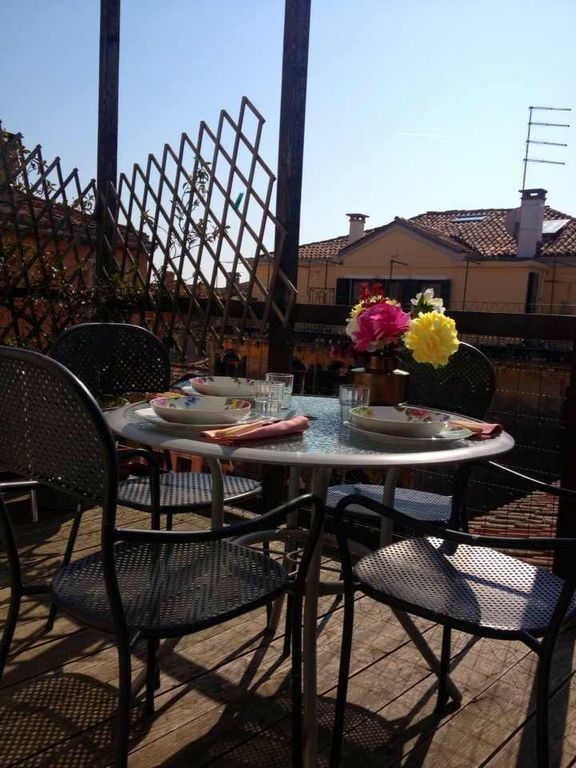 3.Beautiful VENETIAN ALTANA (TERRACE)ON THE ROOF with table and chairs where you can have a very nice breakfast/lunch/dinner or simply relax. 3. FREE WIFI INTERNET CONNECTION, AIR CONDITIONER, dish washer, washing machine, microwave, etc, available. Beautiful property spotlessly clean, and a very gracious host. The only thing I could caution anyone about is the number of stairs one has to climb to get suite, but it is well worth it. Truly spotless, and a great location. Would love to stay there again. Great People, i do thank them so much, everything has been ok with no any problem. I do hope to still have them again as my guests in the future. First, we did plan a meeting point to get to the place - the person was on time, showing us the appartment. You have 3 rooms in the appartment, 2 on the second floor! This was perfect for the couple and the baby. And the other room is on the first floor with the kitchen and the bathroom. Also, they did provider us the coat and the highchair for the baby. I would go back and you should all go! "I spent one week in this appartment in april. It is clean, spacy, well equipped and comfortable. A lot of light which is not common in Venice. The terrace is really great. The owners and local team are really kind and efficient. "In this comfortable and really charming apartment in a very attractive area in Venice. Almost everything was perfect (although the mosquitos at night were a problem) and the owner very courteous and helpful; when we had washing machine problems it was very promptly fixed. We loved the comfortable bedrooms and, in particular, the little outside terrace with its gorgeous rooftop views. We would definitely rent it again." Everything ok, no any problem.